but an ad about some competition for ClassPass, a service that also offers a way to access fitness, dance, rowing, strength training, pilates, and yoga studios all over the city. 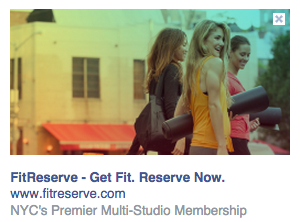 It’s called FitReserve, and its website is almost identical in appearance to ClassPass. Like ClassPass, you have to provide your e-mail address and “request an invite” to sign-up. Unlike ClassPass, FitReserve claims to offer access to “peak class times” that can sometimes get filled up before being offered on ClassPass. FitReserve is only in NYC right now, and while it doesn’t have as many studios on its list yet, it does offer access to a couple different ones like Clay Health Club and Spa, as well as offering discounts with partners like Instacart grocery delivery, Bestowed healthy snacks service, and Zeel massage on demand. It’s also a bit more expensive. $149/month gets you 10 classes a month and $249/month gets you 20. For now, I’m planning to stick with ClassPass, but I’ll be watching to see if FitReserve partner deals and studio access are too tempting to pass up. If Soul Cylce or The Class suddenly deigns to offer classes with them, I’d pay the extra fifty bucks in a heartbeat.